Economic space is the distance that separates economic agents such as manufacturers and consumers. Distance naturally imposes costs on the economic agents, but it has long been a neglected element in orthodox economic theory, one thought to complicate the issue unnecessarily. However, the theoretical implications of assuming away spatial elements may be especially significant for pricing practices and hence for competition. This volume shows why and in what ways the concept of economic space is vital and thus needed to reform orthodox price theory. 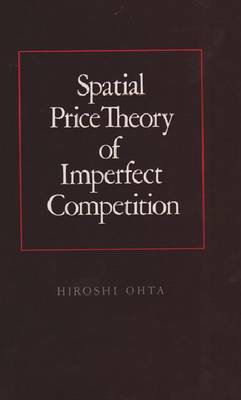 It negates the classical paradigm of perfect competition and calls for a spatial price theory of imperfect competition. Among Hiroshi Ohta's findings in spatial microeconomic theory are that unlimited entry of new firms into the market may not lower consumer prices and that increased labor productivity in a spatial economy may actually lower real wages. Researchers and students of economic geography and regional science and economics will find the author's careful analysis, equations, and illustrations valuable in understanding a decade of advances in spatial price theory and in exploring new theories of competition.